Andi and I had the best time yesterday. We are taking a few days off and instead of a long distance trip, we decided to enjoy time close to home. Yesterday we drove a hour away to a park called Holiday World. I had heard of the park through the Discovery Channel because two of their roller coasters (they only have 3) are consistently ranked in the top 10 wooden coasters in the world: The Raven and The Voyage. Neither of us had been to the park before, so we were excited to just be alone together and were ready to experience the park for the first time. Andi is a big water park junkie. I am not near as fond of water parks as she is, but they are still fun. 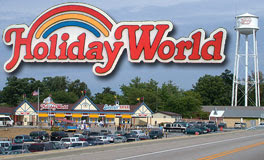 Holiday World has a water park, Splashin' Safari, that is included in the admission price. Let me pause here and say how incredibly reasonable the prices at this park are. The admission is only $37 for both parks, and the have unlimited FREE soft drinks, Pepsi products. And they are GOOD. Better than most fast food restaurants. Plus, the meals are cheap. Andi and I both ate a sizable lunch for only $11. Anyway, we hit the water park first and wasted no time going straight for the slides. All but one of the slides we rode were "dual" slides, meaning we could both ride at the same time. We managed to work our way around the water park, hitting two "lazy rivers" and 7 slides. The best slides of the day were the last ones we rode, completely enclosed slides that were short, but lots of fun. After we changed, we headed for the main park. I loved the layout of this park. Not only is it incredibly clean, but the "sections" of park are broken down into holidays. So, you are either in Thanksgiving, Christmas, 4th of July, or Halloween. That's right folks, Halloween. And that is where we found "The Raven", the wooded coaster I had heard so much about. Andi and I rode all three coasters, two of which were in "Halloween" and one more, The Voyage, which was in "Thanksgiving." All three were better than average, with The Raven and The Voyage topping the list. You can see my "Beast Paw Ratings" below. Another neat surprise was a dark ride called "Gobbler Getaway." This ride, similar to the Cat in the Hat at IOA, had riders carrying a "Turkey Caller" which was really a "Laser Runner" hand held laser. Targets were set up throughout the dark ride for the rider to shoot at. Your score was calculated in front of you. This ride is really more similar to the Scooby Doo Ride at King's Island than MIB at IOA. After catching a "History of Diving" performance, oddly located in the Halloween area, we decided to begin wrapping up the day. We stopped by the Christmas fudge shoppe and purchased a couple of goodies before heading out. It was a great day and we will definitely be back! The Raven - Great atmosphere. The queue is set up in an old house, similar to a Psycho house, with Halloween music playing. The ride itself is short, but fast and takes place entirely in the woods. Think of a much shorter and more compact Beast from King's Island and you have an idea of The Raven. The Voyage - Pure Speed. After an impressive first descent, this bad boy just doesn't let up. Reminded me a little of the brutalness of Dollywood's Thunderhead, except longer. Not as much atmospheric feel to this coaster, but no doubt a great ride. The Legend - Any ride that uses the Headless Horsemen as the logo already gets a thumbs up from me. Although better than your average coaster, this didn't have quite the punch as the other two. Still worth the trip. The Beast Paw Rating: 2 1/2 out of 4 Paws. Glad you had a great time. Lindsay.